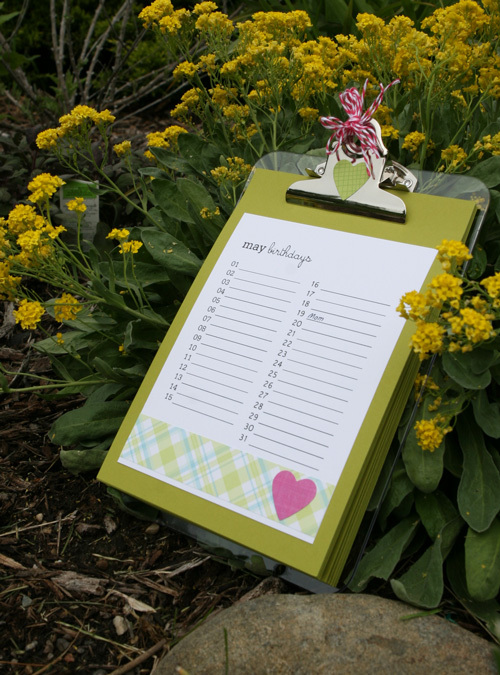 I found these great birthday calendars on the Eighteen25 blog and I knew they would make great gifts! They provide the calendar files on their site so you can download them and print them out. Then, you can embellish them however you choose! I took their calendar files and edited them in Photoshop Elements so I could type the Birthday's on the Calendar. (The page shown just has "Mom" on the 19th.) I then printed them on white cardstock and mounted them on Simply Chartreuse cardstock from PapertreyInk (PTI). I ordered a pack of clear clipboards on Amazon.com because I could not find the small size in the store. I used my heart dies from PTI to cut the hearts. The plaid paper is from Jo-Anns or Michaels and is Recollections "Green & Blue Plaid". It matches Simply Chartreuse nicely. If you make some, be sure to leave the margin at the top of your mounting paper bigger than the bottom so it still looks balanced after it is under the clip.